Multiple feed RSS reader widget. Is there a better alternative to AG RSS Reader? Is AG RSS Reader really the best app in Newsreaders category? Will AG RSS Reader work good on macOS 10.13.4? 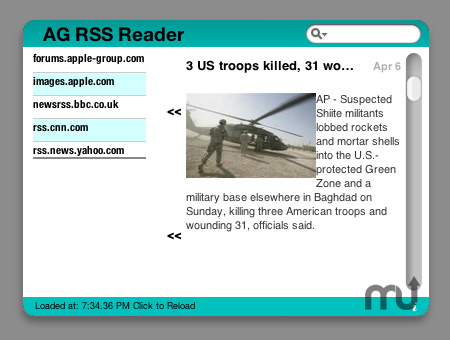 AG RSS Reader supports multiple feeds which are inter-changeable with a few clicks. It is easy to use and stable like all of the Apple-Group Development Team's products. Easily Switch between one RSS or another all from Dashboard. View Pictures in RSS feeds featuring them. Feel secure that you won't forget or miss a thing. Every feed you enter gets saved inside the widget! AG RSS Reader needs a review. Be the first to review this app and get the discussion started! AG RSS Reader needs a rating. Be the first to rate this app and get the discussion started!